Should Coulson come back to life in Agents of S.H.I.E.L.D. season 6? Should Coulson come back to life (again) in ‘Agents of S.H.I.E.L.D.’ season 6? It’s the big question going in to Agents of S.H.I.E.L.D. season 6: Should Coulson come back to life, or finally stay dead? Ever since then-Agent Phillip J. Coulson returned to the mortal coil after his skewering by Loki in The Avengers, fans of Marvel TV have clung to Phil with the power of a million loving tentacles. And for good reason — the coolly-charismatic, calm-under-pressure agent of S.H.I.E.L.D. was a highlight of normalcy against a backdrop of super-heroics, and a trusted presence ushering in the new era of Marvel Television. But after five seasons, it seems that his watch is concluded. Dying of his re-activated wound, Coulson retired to Tahiti (actual Tahiti) to, apparently, spend his final days in peace with Agent May. This development was played as a tragedy in the final act of Agents of S.H.I.E.L.D. season 5, but also a fitting conclusion for Coulson’s story. On the one hand, his life was ending just as he and Agent May had confessed their feelings for each other, and if healthy, Coulson could expect to live for many more years. On the other hand, Coulson was at peace with his fate, accepting death with dignity and little regret. All of this, obviously, means that the Agents of S.H.I.E.L.D. fandom is rather split on the matter of whether or not Phillip J. Coulson should once again be miraculously revived and return to action. So I’ve decided to tackle this debate-style, with a resolution and arguments in favor and against. Let us know which side seems most persuasive to you, and share your reasoning in the comments! Resolved: Phillip J. Coulson SHOULD come back to life in ‘Agents of S.H.I.E.L.D.’ season 6. Pro: IT’S COULSON. IT’S NOT AGENTS OF S.H.I.E.L.D. WITHOUT COULSON. WE NEED OUR COULSON. FULL STOP. Con: Agents of S.H.I.E.L.D. will never be the same without Coulson, but the show has always been very adaptable. They can deal with it, plus his death allows the rest of the cast to grow like they never have before, taking on increased responsibility and dramatic weight. Pro: If Coulson was taken in the Snapture, Avengers: Endgame potentially offers the perfect excuse to bring Coulson back from the dead fully healed, without negating his choices in season 5. 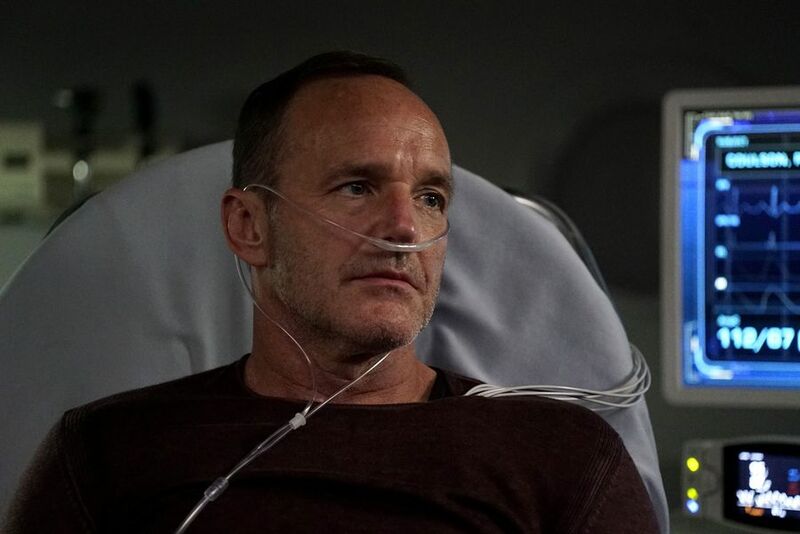 Con: No matter how Coulson is brought back to life, another resurrection will drastically reduce the impact of his death, the choices he made along the way, and the impact on May and Daisy. Pro: If Coulson comes back, he and May can actually be together and be happy! Con: Happiness never lasts on Agents of S.H.I.E.L.D.. Also, giving May a shortcut out of her grief undermines the growth she experienced in season 5. Pro: Coulson can continue to mentor Daisy, Mack, and the whole crew, giving them the guidance they need to become the best S.H.I.E.L.D. agents and Director they can be. Let’s face it, they need the help! Con: The time for mentorship is over. Just as Obi-Wan and Dumbledore died for Luke and Harry to come into their own, so too must Coulson finally stay dead for Daisy, Mack, Elena, and FitzSimmons to truly be strong and independent agents. Pro: If Coulson comes back to life, he can reveal himself to the Avengers and they can all hang out again. Con: That sounds great, but it’s very unlikely. Coulson rejoining the Avengers is a studio issue, not a story issue. Pro: How can they pass up the opportunity to have the story of Agents of S.H.I.E.L.D. season 6 tie in to Coulson’s history in Captain Marvel? Con: Coulson doesn’t need to be alive for that to happen. Agents of S.H.I.E.L.D. season 6 can be a tribute to Coulson without his involvement. Pro: Fans will stop watching if Coulson has really left the show, so he can’t be dead for good. Con: Some fans might stop watching, and that’s understandable. But lots of other fans will keep watching to how Agents of S.H.I.E.L.D. deals with the fallout of both Coulson’s death and the events of Avengers: Endgame. Pro: Coulson’s death is too big of a change. With Phase 3 ending in the last Avengers movie, Agents of S.H.I.E.L.D. needs to keep things consistent for the fans. Con: The changes in the MCU are exactly why Coulson needs to die and stay dead. The whole universe is undergoing a massive paradigm shift, and it doesn’t make sense for the show to just keep puttering along in the same way. If this is truly an “endgame,” then some things have to end. Pro: Clark Gregg is irreplaceable. He’s been a constant throughout so much of the Marvel story, and the joy he brings to fans both through Coulson and by being himself would be a huge loss to Agents of S.H.I.E.L.D., in front of and behind the camera. Con: Yeah, that’s true. But he can still come back to direct! Con: Yeah, no argument there. Agents of S.H.I.E.L.D. season 6 comes to ABC in Summer 2019. Do you think Coulson should come back to life, or stay dead?